The Ukrainian Armed Forces will be reformed to NATO standards. 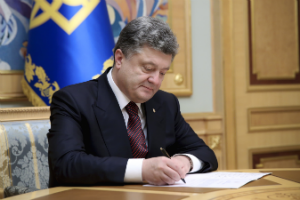 President Petro Poroshenko has signed the decree enacting the Decision of the National Security and Defence Council of Ukraine of 20 May 2016 on Strategic Defence Bulletin of Ukraine, according to his official website. The Strategic Defence Bulletin of Ukraine is a document of defence planning elaborated under the results of the defence review in order to ensure the main directions of the implementation of military policy of Ukraine and the development of defence forces until 2020. The Bulletin is aimed at ensuring practical implementation of the Military Doctrine of Ukraine and the Concept of Development of Security and Defence Sector of Ukraine; defines strategic and operative goals of the defence reform and expected results of their achievement taking into account topical military and political threats and challenges. The document provides for the active participation in the implementation of the Common Security and Defence Policy of the European Union and active cooperation with NATO in the achievement of criteria necessary for the full membership in NATO. The Strategic Defence Bulletin is a road map of the defence reform based on NATO principles. The Decree takes effect from the date of publication.